This page is reproduced from "Backyard Ballistics" by permission of William Gurstelle. 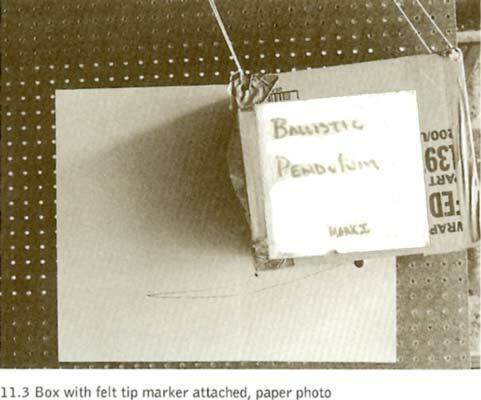 The ballistic pendulum consists of a body of known mass suspended from some light wires, as shown in diagram 11.1. The ballistic pendulum allows you to measure three easily found parameters: the mass of the projectile, the mass of the pendulum, and the height the pendulum rises after being struck by the projectile. From them, you can calculate a fourth, much less easily measured parameter -- the speed of the rapidly moving projectile. With scissors, make an opening measuring approximately 9 inches x 9 inches in the front of the box, as shown in the box detail of diagram 11.3. Reinforce all ends with duct tape. Fill the box with wadded-up newspapers and weights to make it weigh exactly 64 ounces (4 pounds). Attach a string to each upper corner of the box by attaching small eye hooks to the corners. Reinforce the eye hooks securely with duct tape. Attach the felt tip marker to the box so it protrudes just beyond the side plane of the box. Refer to the assembly diagram. 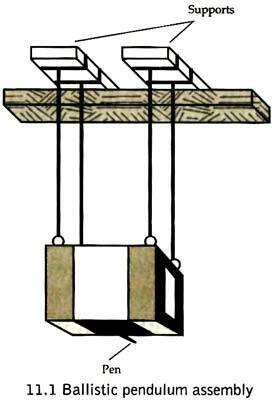 Attach the sheet of paper to the plywood and mount the pendulum and plywood parallel to the pendulum's path. Position the paper so it just touches the felt tip marker.